JUNE ART TALK: Quiet Places & Childhood Memories, Thursday, June 2, 7:00 p.m.
One artist focuses on the small details of small businesses. The other creates child-size sculptures and installations. Both create art that is unique and thought-provoking. During our June ArtTalk at the Bemis Center for Contemporary Arts, Artists-in-Residence Alexa Horochowski and Claudia Alvarez discuss their very different but equally intriguing artistic processes. This ArtTalk takes place on Thursday, June 2, at 7:00 p.m., and as always, this event is free and open to the public. 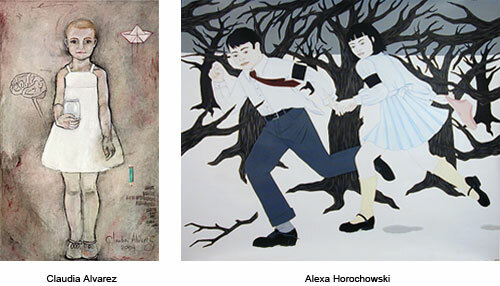 Alexa Horochowski derives inspiration from the broken-down and the down-and-out. Finding locations such as Latino hair salons and Midwestern taverns charming, the painter and photographer uses these unique locations as a means for communicating her own individuality. Her works strive to present quotidian places with the love of a local yet through the eyes of a visitor. Raised in Argentina, the artist notes: “As an immigrant, I can still look at Midwestern culture much as a foreign visitor would. It still feels exotic even though I have assimilated and become a part of this very culture that I am viewing as an outsider.” The artist earned a BA in Journalism and Creative Writing from the University of Missouri, Columbia, MO, and an MFA in Photography from the University of Michigan, Ann Arbor. A veteran of solo and group exhibitions, Horochowski has been featured in publications such as Sculpture Magazine and The New York Times. In this recent body of work, Claudia Alvarez focuses on creating an installation featuring child-size sculptures. First, she builds wooden swings and then creates life-size ceramic forms in an approach that emphasizes how these objects interact with one another. The image of the child is a recurring theme, working as a metaphor for life, death and rebirth. Some of these compositions are fragmented, others are fragile, but they all communicate the strength of the human spirit. Alvarez received her BA in Ceramics from the University of California, Davis, and an MFA in Ceramic Sculpture and Installation & Mixed Media Painting from the California College of Arts in San Francisco. She has exhibited widely in both solo and group exhibitions, including a recent show in Rapperswil, Switzerland. Both artists offer fascinating perspectives for communicating creativity. Join us at the Bemis Center for Contemporary Arts on painterly and photographic approaches.